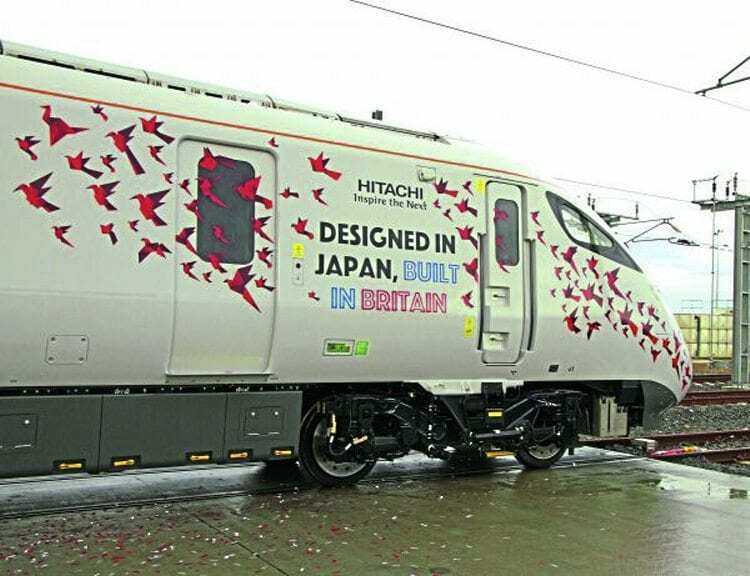 Hitachi has rolled out the first Class 800 bi-mode to be assembled at its factory in Newton Aycliffe, County Durham. Five-car bi-mode No. 800005, which is destined for use by Great Western Railway from later this year, had the honour of becoming the first of the type to be assembled in the UK. The set was rolled out of Hitachi’s factory in Newton Aycliffe, County Durham, on December 9. All previous completed IEP sets had been shipped in from Japan. Hitachi opened its £82 million Newton Aycliffe site in September 2015, and by spring 2017 will employ around 900 workers. The company is still expanding, however, and expects to employ around 2000 people nationwide by 2019 at 14 locations, including manufacturing and maintenance sites. A total of 252 trains are currently on order with Hitachi for British operators: 122 Class 800 (bi-mode) and 801 (electric-only) IEPs for Great Western Railway and Virgin Trains East Coast; 60 Class 802 bi-modes for GWR (36), Hull Trains (5) and TransPennine Express (19); and 70 Class 385 EMUs for ScotRail. Most of these will be assembled at Newton Aycliffe using a mixture of imported parts and components manufactured in the UK. Hitachi says that 70% of the parts for the IEPs will be sourced in Britain, including Dellner couplings, Lucchini wheelsets, Siemens GSM-R radios, Thales TPWS/AWS safety systems, Brecknell Willis pantographs and Knorr Bremse brake systems. The factory is still ramping up production, with each vehicle taking around a month to complete and total capacity being around 35 vehicles per month. The first IEPs are due to start work with GWR later this year and with VTEC in 2018. Read more News in Februarys’ issue of Rail Express – out now!